Intech Equipment and Supply often receives inquiries from customers and contractors searching for straight answers to their questions on how to choose the right sprayfoam equipment. I am new to the Spray Foam insulation business, and want to know what features I should look for in a sprayfoam rig? Sprayfoam rigs house your sprayfoam machine, compressor, generator and various equipment. 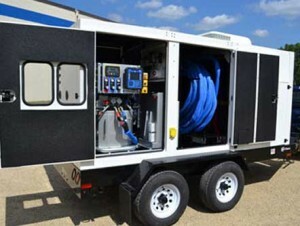 A typical mobile spray foam rig houses a separate work area with various helpful tools; a sectioned-off area for sprayfoam machinery, including pumps, a compressor, and a generator; and, a material storage area. When choosing a sprayfoam rig, there are many aspects to consider. For starters, ask yourself what type of insulation jobs do you plan on bidding? For example, will you be concentrating your efforts in the commercial or residential realm? Or, perhaps you want to focus on new construction, existing and remodels, or roofing jobs only. Also, if you do not have previous experience in the SPF industry, will this be your first time taking the leap? You must properly insulate a sprayfoam rig for it to remain reliable. The chemical must maintain a particular temperature, typically stored between 60-75°F, to work properly. In warmer climates, you will need to equip your sprayfoam rig with air-conditioning, while in a cooler climate, you may need a heater. You should also insulate your rig’s ceiling, walls, and underside with SPF. Why? Foaming the underside helps it last longer, especially if you live in an area of the U.S. where road crews use salt to de-ice the roads. To insert your SPF transfer pumps into the 55-gallon drums of chemical, you must have a minimum interior rig height. If the inside of your trailer’s height is too small, you risk challenges inserting your transfer pumps into the barrels. Also, a shorter rig height requires you to tip the barrels to insert pumps, which is not an easy task with a barrel full of chemical. Just as important as choosing your sprayfoam rig is the professional training you receive on how to operate it, about the SPF industry, chemical application, equipment maintenance, and safety procedures. To help make your shift into the SPF world a smooth one, our team of experts has already done the difficult work for you: we have experience spraying foam and repairing and maintaining equipment, and we know how to sell products, so you receive superior service. We also offer year-round training classes so you can stay up-to-date on the latest in SPF, as well as receive certification for various products, equipment, and safety measures. Our sprayfoam rigs and trailers are designed and manufactured using our custom specifications, as well as by incorporating customer requests and unique SPF equipment demands. We can install equipment packages in your current work vehicle, or we can make available a new truck or trailer for installation, upon request. We always include two days of equipment training and delivery anywhere in the Continental U.S. in any custom sprayfoam rig purchase. · Classical Contractor Mobile Spray Foam Rig. This sprayfoam rig is the perfect entry level vehicle. We design these specifically for the budget-conscious SPF insulation contractor, and they are ideally suited for those businesses that spray approximately two sets of open-cell or closed-cell applications each day. · Interstate Mobile Spray Foam Rig. For more than 10 years, the Interstate models have been our best sellers to contractors who are searching for a fully-outfitted mobile sprayfoam. This rig has proven to be the best model on the market as a turnkey product, especially for those SPF contractors new to the business. · Pro Series Mobile Spray Foam Rig. We design all of our equipment designed with SPF professionals top of mind, and Pro Series sprayfoam rigs are no exception. These rigs are customized by the contractor and the rig designer to be a perfect fit for any commercial or industrial application. At Intech Equipment and Supply, we understand that launching or expanding your SPF business is hard work and a significant investment. Our team is here to help you and your team get on track, and we can set you up for success with the proper sprayfoam rig, related equipment, and training. Intech strives to ensure a great relationship with every aspect of the SPF business, including the manufacturers that build the products we sell. From spray foam rigs, SPF guns and proportioners to pumps, heating blankets and everything in between, we are your one-stop-shop for SPF equipment and resources. Call us today at (866) 652-9975 for more information.